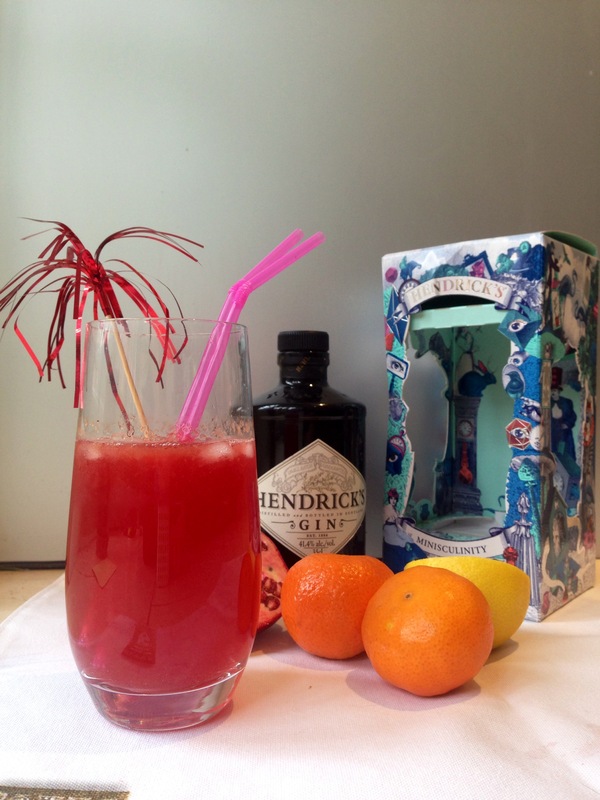 I have been lucky enough to be asked by Waitrose Cellar and Hendrick’s gin to develop a cocktail. There were two categories – hot or cold cocktails featuring gin. Fortunately for me I was assigned the chilled cocktail. I’m not the biggest fan of hot alcohol and would struggle to create one – however, I will test the recipes submitted for the challenge, as you never know I might change my mind after the right drink! Actually I was not the biggest gin connoisseur – but then again I’d only really drunk it as gin and tonic in the occasional pub or bar, which most probably didn’t use any premium gin. 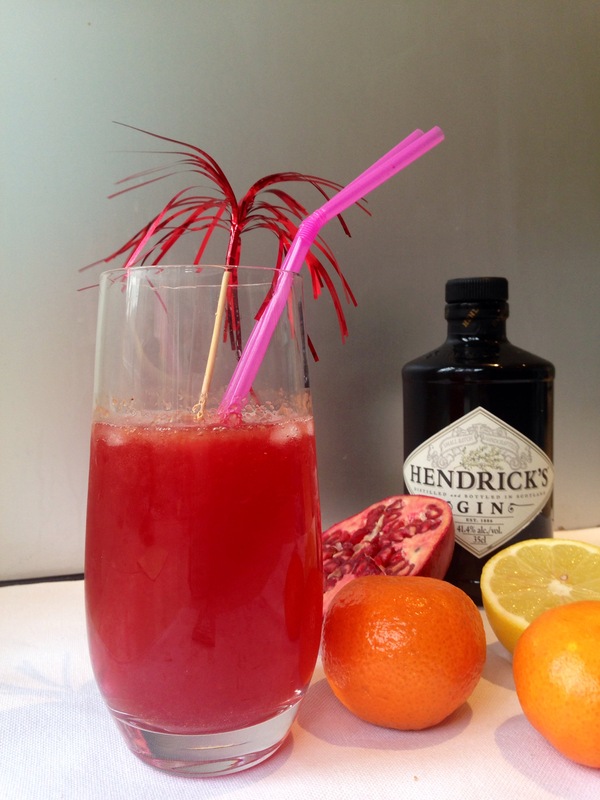 And I know the premium brands such as Hendrick’s offer much more reward in terms of flavour and refinement. This challenge has indeed opened my eyes. Hendrick’s gin is a flavoursome, fresh feeling, cucumber and rose-tinged delight. So, with my complimentary bottle of fine gin, I’ve spent a highly enjoyable festive season playing around with possible flavour combinations. I had initially thought of a gin and champagne-based cocktail as suitably celebratory for the festive season, but I found the combination too confused. Was it a cocktail? Was it a flavoured fizzy wine? That idea was quickly shelved. I am always a fan of using ingredients that most people are likely to have at home, rather than unusual additions that can only be sourced online or in very specialist shops. Clementines seemed a suitable choice as I’m sure most people have a few specimens hanging around in the fruit bowl after Christmas. Pomegranate may not be particularly everyday but does have a lovely festive red colour and is quite ‘now’. As it turns out it’s a really pleasant combination to use those two fruits and works equally with or without the gin. They are both on the sweet side, particularly as I have used a dash of grenadine so this needs a little balancing with lemon juice, and it’s mighty refreshing. Ice brings it all together. 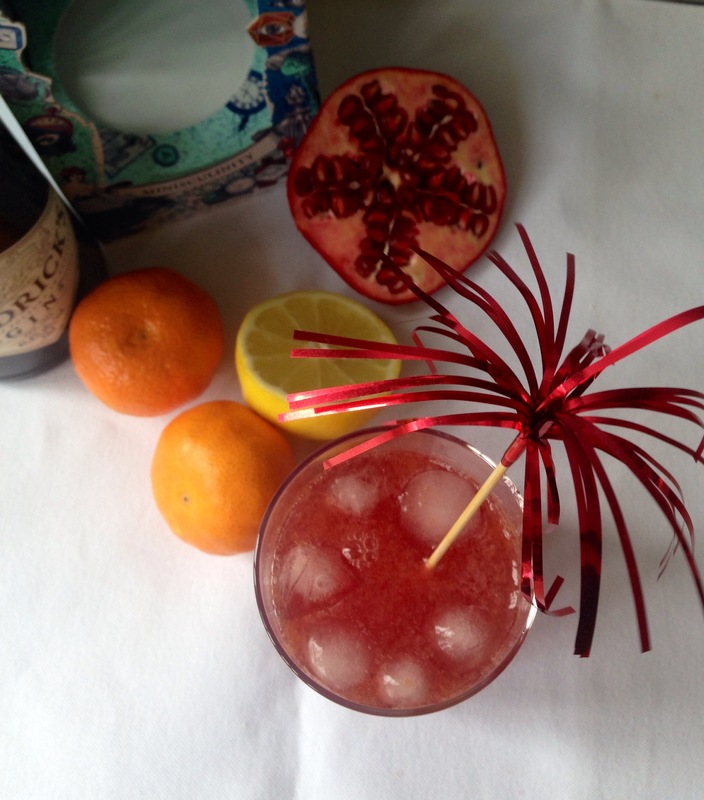 In the end I think my ruby red gin cooler is quite a stunner of a cocktail – fruity, quenching, fizzy, tangy and a bit sweet. Bottoms up and a Happy New Year to all! – Top with lemonade, and adorn as you wish. For those of us who are dairy-free, or even more so for those of us with dairy-free children, it’s a constant battle to get enough calcium in to keep the dietician happy. Over the years mine have had dairy-free yogurt so regularly that they can hardly stomach another mouthful. I exaggerate a little, but they are fed up with it. 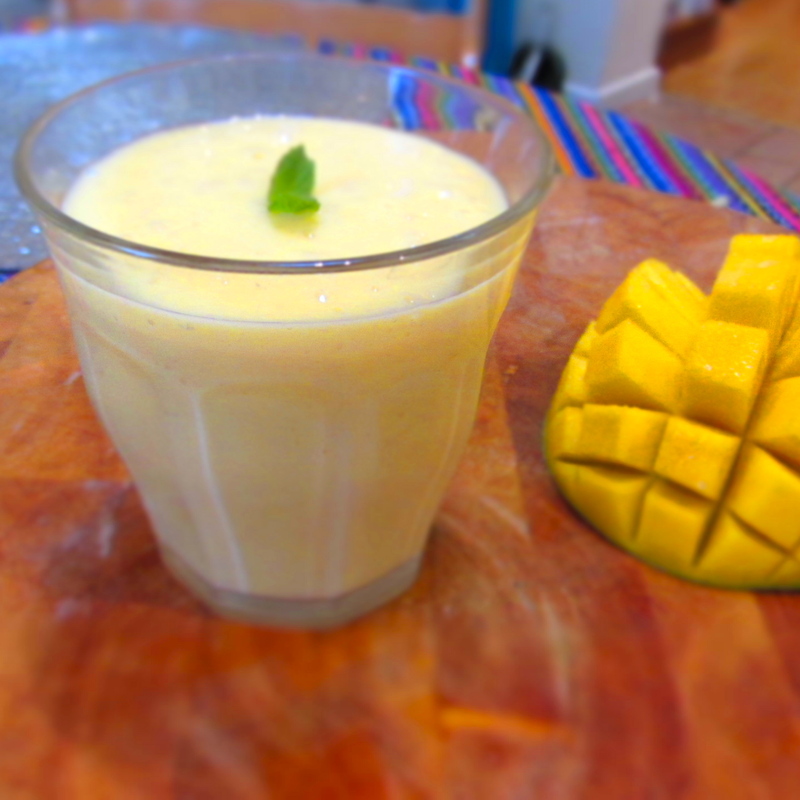 Then it came to me – what about a drink instead, not a plain old milkshake but a super refreshing lassi, flavoured with a fresh ripe mango (and boy are the mangoes good at the moment)? It was a resounding success, both girls guzzled down a glass full of fruity, calcium-rich goodness on return from school with no hint of a sigh. A great, nutritious and filling snack to keep those hunger tummy rumbles at bay! Traditionally served in India as a refreshing and usually spiced digestif, I think this dairy-free version would work in any scenario. 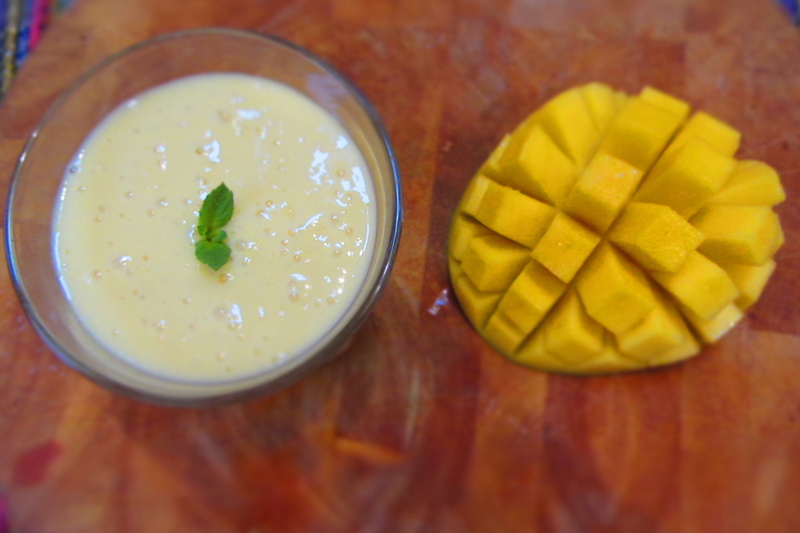 I used soya yogurt but I reckon coconut would work pretty well with the mango flavour. Be sure to add the salt though – it may just be a pinch, but it really does make all the difference, and a lassi is traditionally sharp in flavour. 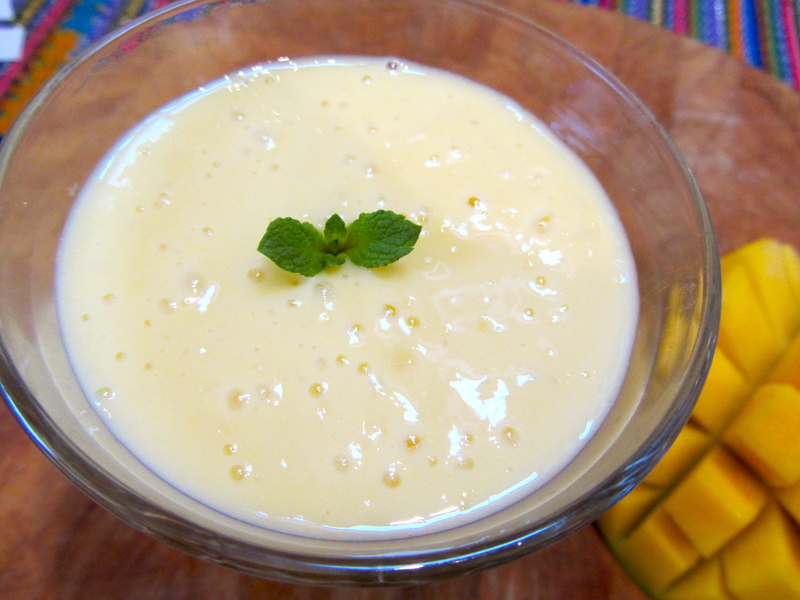 – place the mango and sugar in a blender with the yogurt. – Blitz to a smooth puree. – Pour in the water and blitz again to a smooth, thick liquid. – Add the salt. Stir and taste. Add more salt and sugar to taste. Apparently it’s a bumper year for blackberries in the UK, and if our garden is anything to go by, we’ll have blackberries coming out of our ears in the next few weeks! 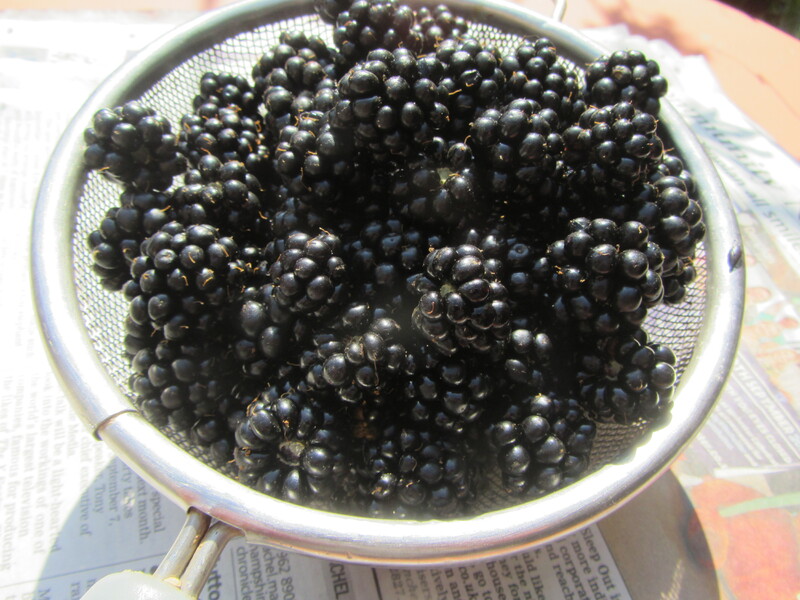 Having just returned from holiday the brambles in the garden were weighed down by beautiful, if slightly over-ripe berries. This called for an immediate recipe solution! 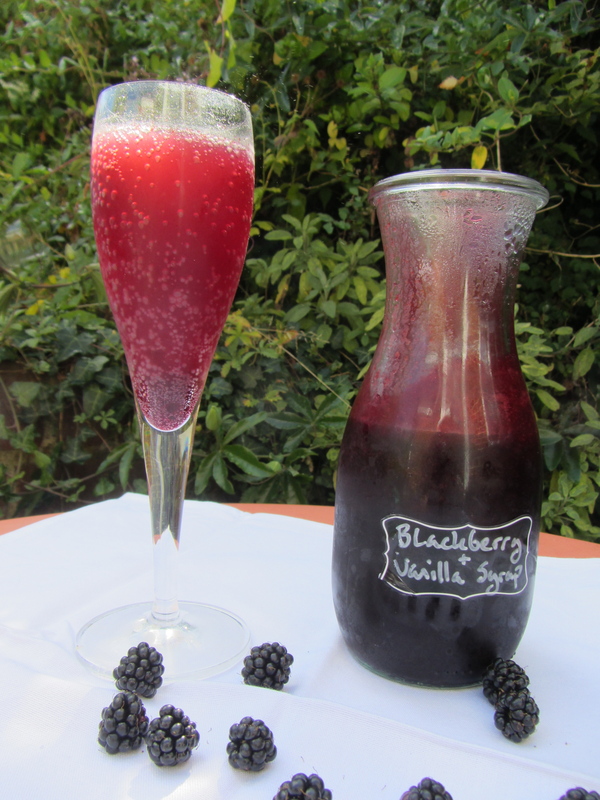 This delicate blackberry and vanilla syrup is a fantastic way of using up berries and results in a smooth, fragrant, only slightly sweet syrup which works beautifully when mixed with champagne for a ‘kir royale’, or equally well with sparkling water or lemonade. – Combine the puree with the sugar and vanilla in a saucepan. Bring to a boil and then simmer for 3 minutes. 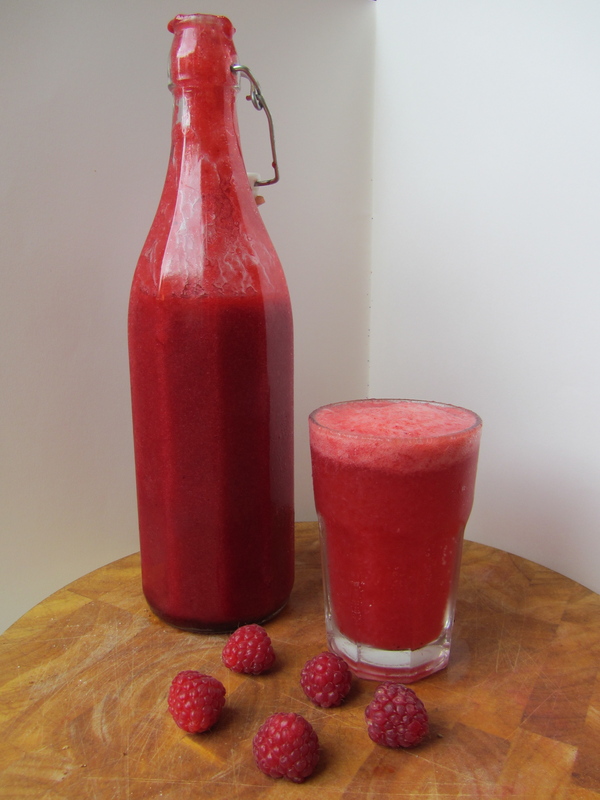 – Pour into a sterilised bottle and keep in the fridge for up to 4 weeks. – To use, dilute 1 part to 4 of champagne, water or lemonade. If, like us, you have piles of clementines hanging around after Christmas and you’re a bit fed up with the whole festive thing, you need to use them up fast! Here is an excellent way of using up the soft squidgy ones, using all their lovely scented sweetness. This would make a fabulous base for any number of refreshing drinks. – place all the ingredients in a pan, bring to the boil and then simmer for 5-10 minutes until sticky. – strain into a sterilised bottle. – leave to cool, then cover and keep in the fridge. I have no idea why I’ve always bought cordials, they’re so easy to make and homemade can only much more natural and therefore healthy than anything store bought. Citrus is one of Big S’s favourite flavours and since we’ve had colds hanging around for weeks I thought a big dose of vitamin C would do us some good. So my first foray into the homemade mixer world is lemon and lime. – Zest the fruit with a vegetable peeler and place in a saucepan with the juice of the lemons and limes. 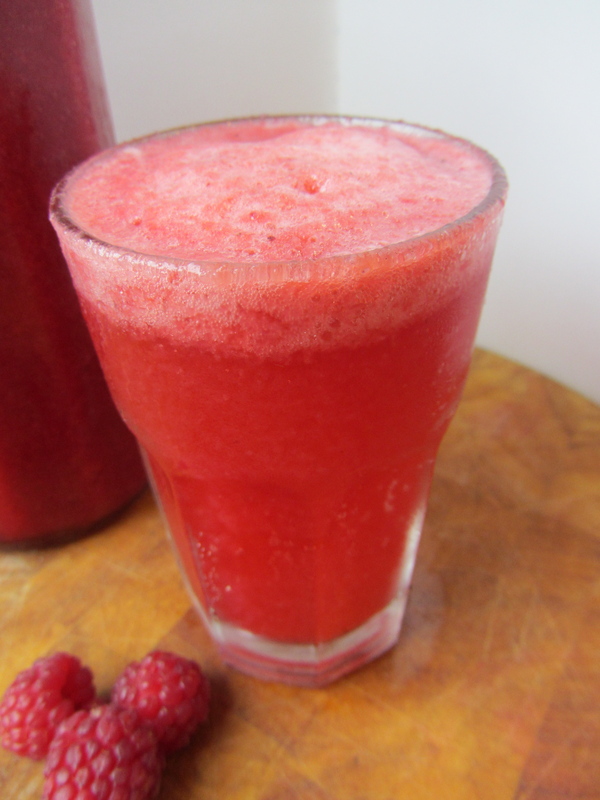 – Add the water and caster sugar. – Heat and stir until all the sugar has dissolved, then simmer for five minutes until slightly syrupy. – Pour into a sterilised bottle and keep in the fridge.